One of the best verses in the Old Testament is Psalm 145:8: “The Lord is gracious and merciful, slow to anger and abounding in steadfast love”—lot’s of potential for decent religion here. In this verse, “the Lord” is actually a translation of “Yahweh,” and we regret that this sentiment about mercy and love didn’t have more influence on those ancient thinkers who fleshed out the character of Yahweh. This tribal god rampages violently through so much of the Old Testament. I suspect that the blood obsession still haunts the Christian psyche when I read that a vial of Pope John Paul II’s blood toured the U.S. in 2014, to be venerated by the faithful (not worshipped, church officials insisted), especially in the wake of John Paul’s canonization. Apparently, during one of the pope’s many illnesses, one nurse was savvy enough to spirit away a vial of his blood—no dummy she. A pope relic was a big prize; there were Catholic hearts to be set aflutter and coffers to be filled. Relics are big business. A saint body part is the best relic, and what could be more prized than a piece of Jesus’ body? We are told specifically in the New Testament that one piece of his body was cut off; more than a few churches have claimed to possess Jesus’ foreskin. We trust, of course, that there could have been only one. I wonder why anyone would want to venerate a part of Jesus that they deny he ever made full use of. Second best is an item owned by the saint; third best, something touched by the holy person. I have also seen somber women dressed in black in dark cathedrals touching the frames of saint pictures and muttering prayers—as if to pick up a flow of holy energy. Relic adoration is one of the most bizarre aspects of Catholic piety, religious sentiment gone entirely off the rails. 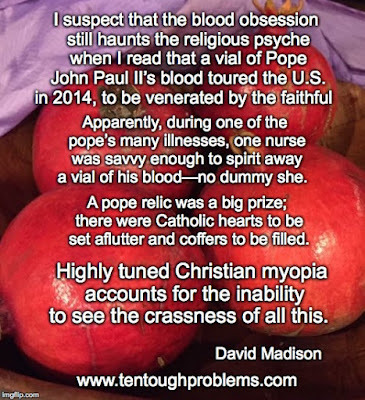 Highly tuned Christian myopia accounts for the inability to see the crassness of all this. And the implications: The pathetic, desperate attempt to grasp holiness at close range—with the eyes if not by touch—suggests perhaps a hint of skepticism or even latent atheism. Are the pious trying to ward off disbelief? God is so distant and invisible, but a fragment of a saint puts God almost within reach and—maybe—real. So the pope’s blood goes on tour.